This post is sponsored by Burt’s Bees. Thank you for supporting the brands that support this blog. All opinions are always my own. Ever since Aimery’s first tooth came in, I’ve been dedicated about brushing his teeth every day. He almost has all of his teeth, we just have his upper second molars to go and then he’ll be all done teething! I’m about to schedule Aimery’s first dentist appointment and have been working with him every day to teach him how to properly brush his teeth - and to have fun while doing it. 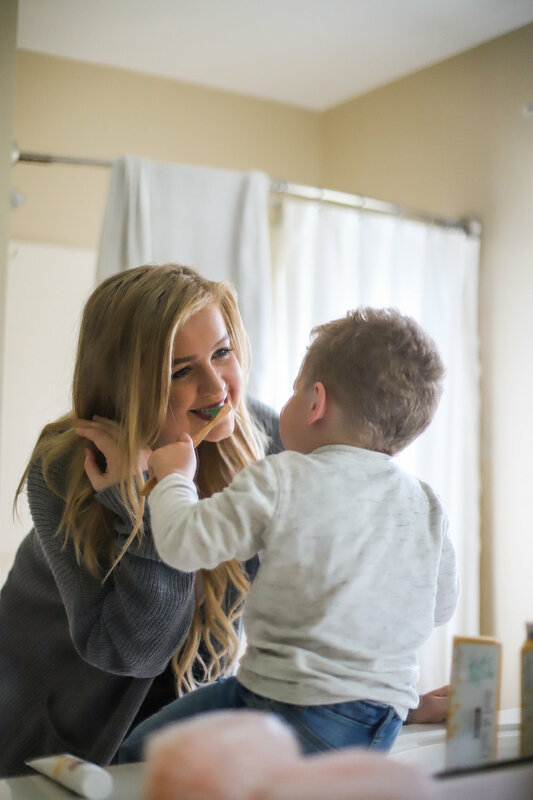 Keep reading for tips on how to make your toddler love to brush his teeth! I have found that Aimery is more likely to do something if he thinks that it’s his idea! He is definitely in the toddler independence stage where he wants to do everything himself. Since dentists recommend that parents help their children with toothbrushing until they are 8 years old, I try to give Aimery choices during toothbrushing since I have to help him with the process. He has two favorite toothbrushes that he can choose between - each in a different color. When it’s time to brush his teeth, he is always excited about picking his color toothbrush for the day! This allows him to have fun with making a choice, before I have to help brush his teeth. I have been searching for the best toothpaste for Aimery since he was a baby. While shopping at the new Wegman’s here in Lancaster, I found the New Burt’s Bees toothpaste and love that it is formulated with ingredients that I can trust for both Aimery and I. It works like the leading toothpaste at fighting cavities and leaves your mouth feeling clean! Burt’s Bees toothpaste is great for us because I don’t have to trade off ingredients with great performance. They have three adult formulas and two for kids - where you can choose between fluoride and fluoride-free products. Aimery loves the Fruit Fusion flavor, which makes brushing his teeth SO easy! Toddlers love to do things together! I always try to brush my teeth with Aimery so he sees that I also brush my teeth everyday. Although he is young, I show him how I brush my teeth so he can learn how to do his own. Lead by example and show your child the importance of brushing your teeth everyday! You have to make toothbrushing fun for toddlers! It may sound silly, but toothbrushing is one of the few times every day where we spend quality time together. We sing his favorite songs while we brush (recently his favorites are Happy and You Know it + Baby Shark). And you can’t forget to have bathroom dance parties! Toddlers also respond well to making teeth brushing a game. Try asking your child where their teeth are, and act surprised when they open their mouth! Most toddlers thrive on routine, so try to brush your child’s teeth at the same time everyday. For us, I always brush Aimery’s teeth with Burt’s Bees in the morning before breakfast, and after his bath before he goes to bed. 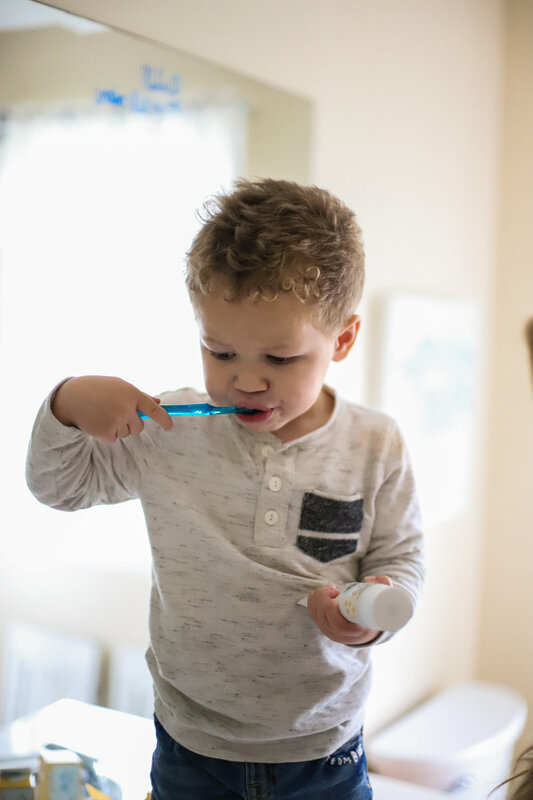 Many parents opt for brushing their teeth right after dinner since their children might be more interested in doing it when they aren’t tired! Try out a few different times every day and see which is best for you! What are your best tips for brushing your toddler’s teeth? Comment below!